You know, composting isn't for the weak of heart or stomach. Initially when I suggested to my husband that we start a compost pile, his reaction leaned towards being disgusted. Nasty trash rotting in my backyard? What would the neighbors think? But if it's done right (and the rules aren't hard), your plants are rewarded with highly nutritious soil, and before you know it, you'll see the benefits in your plants. 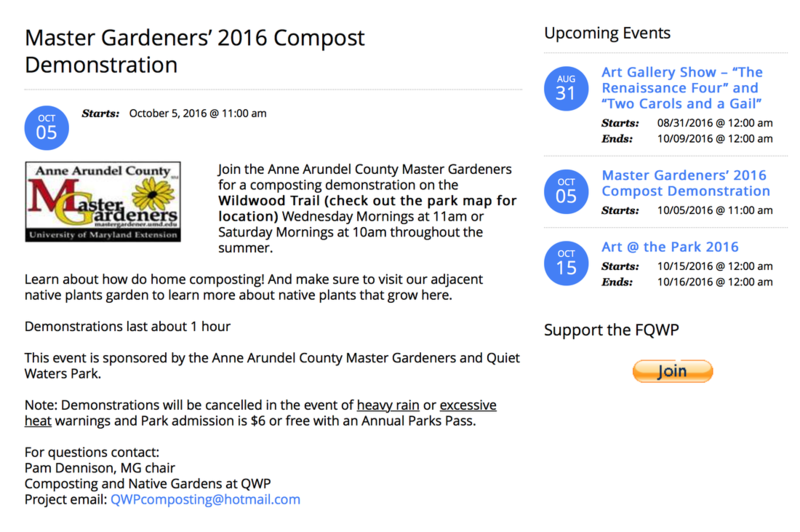 At Quiet Waters Park, the Master Gardeners of Anne Arundel County frequently give demonstrations on composting. If you missed one, keep checking their website, as they'll keep doing them periodically!